Many moons ago, there was this cake. I made it for my high school graduation party (because that’s normal) and every time I think of it, I laugh. I laugh because of Laura. Laura is my best friend of 27 years and also my proof editor for this blog. I was going to say ‘editor at large’ but she’d kill me if I used the word large and her name in the same sentence! She volunteered herself for this position, and has become quite obsessed with my over usage placement of commas, ( ), and … ‘s. She was an English major, you can’t blame her. So, what’s so funny about Laura and the cake? It ended up in my face! Yeah, that’s right- graduation cake in the face. While her mouth was full, she tried to tell me that it was ‘sooooo moist’ but instead, spewed cake crumbs with military precision all over the place, into my eyes and everything. It didn’t help that I was only inches away from her. We laughed hysterically. You had to be there. It just so happens that the texture of these cupcakes reminds me of my graduation cake. They’re super moist and fluffy, just like back in the day. My grandmother taught me that cornstarch (and sifting no less than 3 times) is the secret. I used to use cake flour to achieve the same effect, but when I found out that it was bleached I freaked out and never used it again. Bleach is for laundry, thank you very much. Cornstarch works just fine. If cupcakes are not your thing, this recipe makes a beautiful cake too (see recipe notes). You can even change up the fruit toppings as well- let your imagination run wild. To achieve light and fluffy cupcakes, make sure to sift all of the dry ingredients no less than 3 times, 5 times is best. Also, using small apples for this recipe will ensure that the slices will fit snugly into the cupcake molds. I bought my tulip baking cups here. 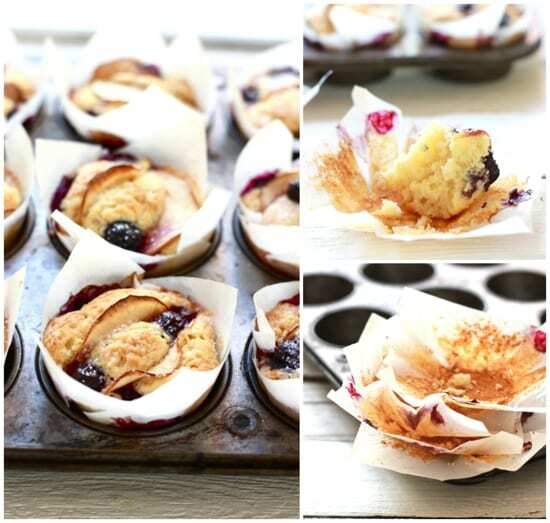 Preheat your oven to 350 F. Line a muffin tin with baking cups. Measure out 1½ c. of flour, making sure to remove 2 tablespoons. In a large bowl combine all of the dry ingredients. Sift no less than 3 times, 5 times for best results! Set aside. In an electric stand mixer, add the softened butter and sugar. Cream together until light and fluffy, about 1-2 minutes. Scrape down the sides of the bowl. Add the eggs, 1 at a time and beat until well incorporated. Working in batches, and the buttermilk and dry ingredients. Mix until incorporated. Fill each baking cup about ⅔ full. Top with blueberries and about 3 apple slices, tucking them gently into the batter. Bake in the center of the oven for about 25- 30 minutes or until a toothpick comes out clean when inserted. * To turn this recipe into a cake, lightly grease a 9 inch spring form pan. Bake for about 45-55 minutes or until a toothpick comes out clean when inserted. Cool on a wire rack before serving. Wow, I think I could use a Laura in my life (on the editorial side I mean ;-)) and as for this cake… simply radiant! (although I probably would prefer not to have it spewed in my face – that is a great story!) — funny how food can remind us of special memories… loved reading about this one. Those cupcakes are seriously beautiful Emilie. Well done! 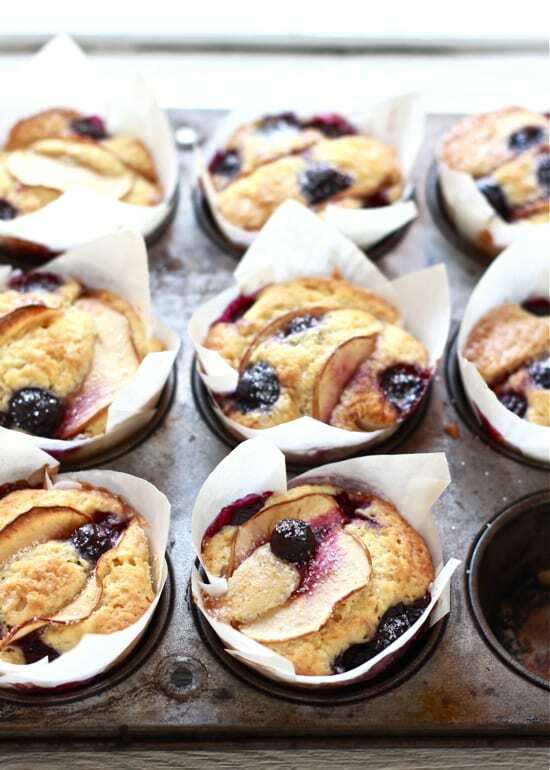 ummmm…buttermilk, blueberries and apples…PERFECT. These are beautiful :) I loved reading the story as well and I agree with Kelly, I really wish I had an “editing Laura” in my life too! These are so, so pretty. Pinned! Lol! Great story and gorgeous photos! As a fellow English major and messy eater, I feel like I can relate well to your friend Laura…too funny! OMG! These cupcakes are sooo gorgeous! I am seriously staring at the screen without blinking. I made this tonight! I decided to go with baking it in a spring foam pan, instead of using cup cakes to save on time. This is so delicious!! Even my picky six year old son loves it. Thank you! These are beautiful. My son and I baked these today and followed the recipe but used Almond milk instead of Buttermilk. Tasty and love the texture of the fruit. Will try it again but will add a pinch of flax meal (for the fiber) and a bit more sugar next time so it doesn’t have that corn bread taste. Just made these and they turned out great. I made my own parchment liners. I didn’t have buttermilk so used Greek yogurt and milk. The only problem I see is not eating too many. I found them just right for sweetness. Thanks for sharing this recipe it’s a keeper. I bake those cupcake, and they were delicious !! Even with the USA/French conversion, I manage to prepare light and moist cakes ! (what do you do with the 2 tbsp removed ? I baked this cupcake twice and I have 2 problems: 1) why do all the fruits sink to the bottom? And 2) why does the sugar on top doesn’t create a nice crust like in the photos? Any help? 1.) 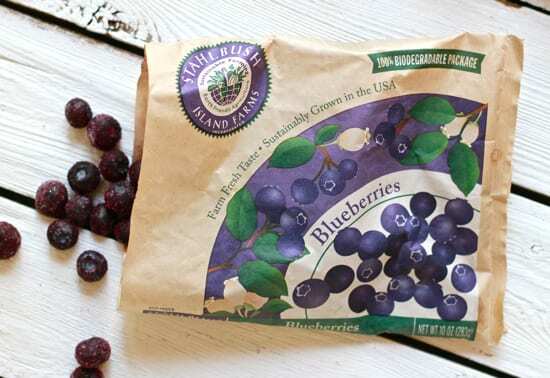 As far as the fruit sinking to the bottom, are you folding the blueberries and apple slices into the batter? 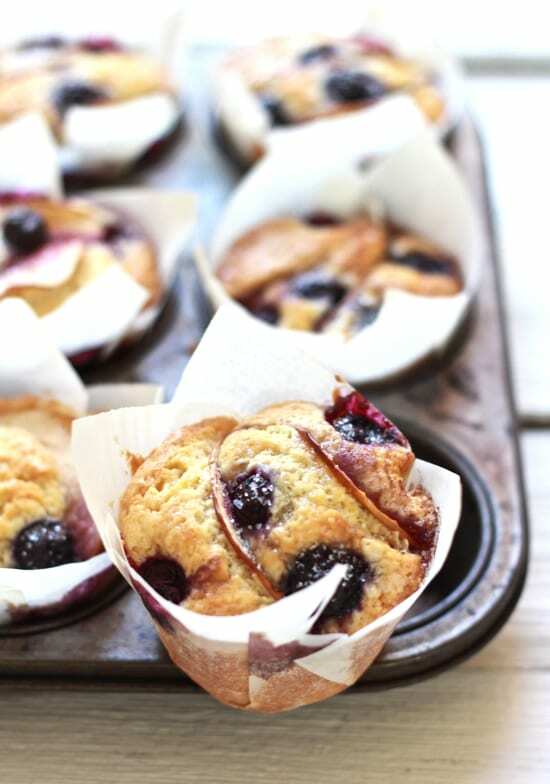 For this recipe, you are supposed to top each muffin with the fruit, gently tucking them into the batter. They are not combined into the mix (which might have caused them to sink). However, as per other recipes when fruit is incorporated into the batter, it helps to toss them in a small amount of flour first before adding. This will prevent them from sinking to the bottom. 2.) For the sugar, what kind are you using? I use a sanding sugar which is made up of coarse crystals. This variety gives it that ‘crust’ like look. Hope this helps! If you have any other questions, please let me know! Good luck. Thank you Emilie. Your recipe tastes amazing. It’s very moist and perfectly sweet. I got lots compliments, but I’m working on achieving the look. 1.) I topped 5 frozen blueberries and 2 slices of fresh mini apples. Does it matter how many fruits per a cup and whether they are fresh or frozen? They stayed on top until they are baked. 2.) I used sanding sugar. I got it from the baking supplies shop in USA. Does the sanding sugar else have bigger crystals? Did you sprinkle it before or after you bake? 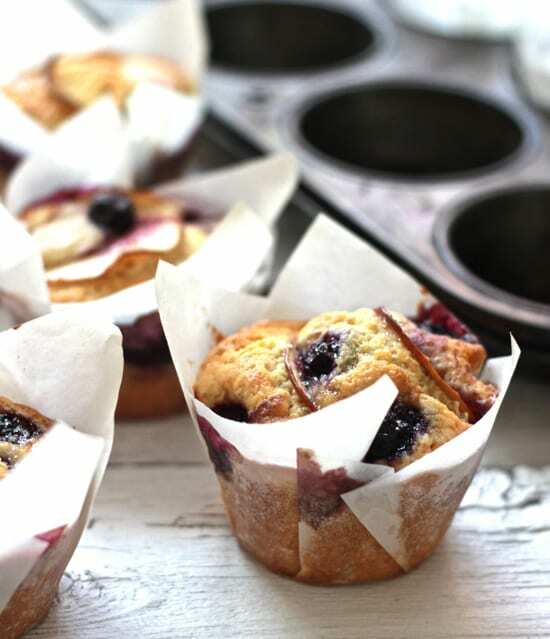 I just love how you tucked those apple slices and blueberries into the tops of these muffins! So so pretty! I have just come across this blog looking for sourdough recipes… I made these cakes this morning and they are amazing, thank you for the recipe!!! I did not have sanding sugar, but the muffins develop a nice crust on their own, so extra sugar is not strictly necessary :) Also, these do not look so pretty in regular muffin/cup cake liners, you really do need the tulip liners for these (to encourage them to climb, I suspect :) ) . I also tried the maple glazed bacon recipe and it is great. Next on my agenda is zucchini bake and then the bread. Thank you so much and best of luck with the book and blogging! Sounds wonderful! I haven’t tried this recipe using Cup 4 Cup, but if I were you, I’d simply leave out the cornstarch in my recipe. I would also do a test batch before your ladies weekend just to make sure. Hope this helps! Thank you so much for the suggestion. I made these a week or so ago for a house concert we were hosting and everyone LOVED them. I’ll let you know how the turn out. These look great. I’m going to make a double batch for my son’s first birthday. Do you recommend just doubling, or making two separate batches (I want to ensure I keep the fluffy texture). Thanks! Just made these this morning, my whole house smells amazing. I had to make a few adjustments because I had no buttermilk but they still rose and look fluffy. I had no idea sifting would make such a difference, I always commit baking blasphemy and never sift….